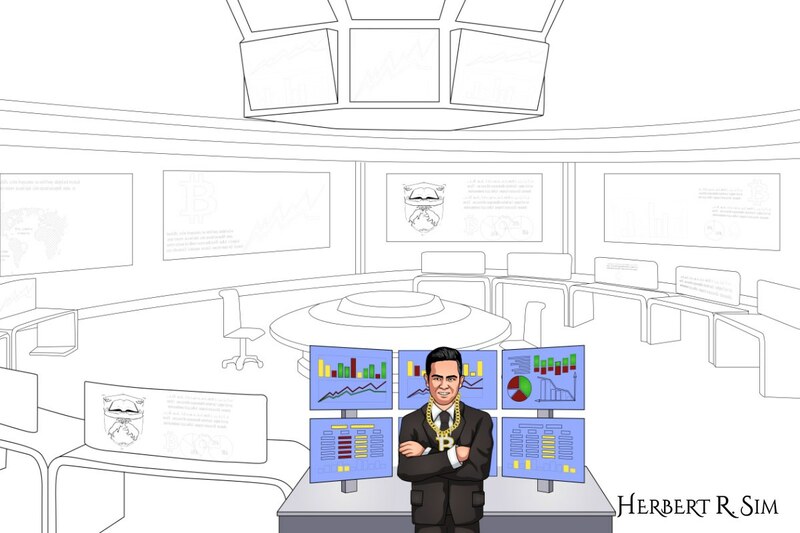 An illustration of myself as The Bitcoin Man, with my iconic Bitcoin Chain, in a futuristic stock exchange looking room, for the trading of cryptocurrencies. Cryptocurrency has become entrenched in our daily everyday life, with many people owning Bitcoin and other alternative coins (altcoins). Although mostly geared as a true money substitute, BITCOIN, for one, has experienced phenomenal investor interest. Daily and longer-term trading of digital coins has become a way of life for millions. Cryptocurrencies are stored on their blockchain, unlike legacy fiat protocols where a user’s money is stashed with a central authority. The blockchain is a highly encrypted and highly secure mode of transacting and storing currency, and comes with certain vast improvements over fiat currencies. A curious phenomenon for many newcomers is that simply by owning a bit of the right crypto, fortunes can be made almost overnight. This is the most publicized and volatile aspect of cryptocurrencies. Digital currencies are, first and foremost, currencies, and in order to avail themselves of some, users will have to purchase from reputable industry sources, no matter the route followed. Picking up some BTC is made easy on cryptocurrency exchanges like Huobi, Binance, OKEX, Bitfinex, Coinbase, Gemini, LocalBitcoins, Poloniex, among others. Users usually get on the ladder via the two top virtual currencies, bitcoin and ether. This is a typical scenario, as most exchanges and wallets cater primarily for BTC and ETH and require users to transact with them. Once purchased, digital coins are easy enough to trade off against others. Every digital coin trader and investor relies on certain essential tools that aid in analyzing price movements and optimizing strategy. Any profession has its set of essential tools, and trading with or investing in cryptocurrencies Is no different. This is the default site for gleaning current prices and relevant market cap on any digital coin. The site offers a detailed snapshot of the virtual currency market. CoinMarketCap has become an essential tool of investors and traders as it gives detailed intel on listed currencies. Market capitalization (or market “cap”) shows the total number of a coin in circulation when multiplied by its current price. Price shows a digital coin’s value in price, compared to or rather extrapolated into fiat (typically USD) values. Volume snapshots on the site immediately give traders intel on how much of a coin has been traded within a nominated time frame. Supply gives users information about how many particular coins are in circulation, something that due to mining Bitcoin, for example, fluctuates. This intel is all collated and displayed logically and professionally onsite. The CoinMarketCap platform is for many the ideal marriage of legacy professionalism and intel, with a wholly crypto focus. It is one of the most popular cryptocurrency sites, giving genuinely valid and, indeed, essential investing and trading data. Gleaning information on market cap, price and volume enables investors to understand trading’s technical analysis, while also pointing to legitimate entry and exit points for traders. The platform has managed to present all relevant coin information in an elegantly simple way, and the site is a default stop for almost any crypto day trader. Another gem of the cryptosphere, Crypto Chain University (CCU) has put together a massive repository of blockchain and cryptocurrency research papers from across the world. This massive project started in 2010, making it the oldest institute for the compilation of crypto and blockchain research. 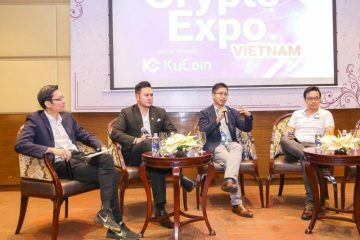 They have even a list of Top people in Crypto and Blockchain, where at one glance, you would be able to find out whom the thought-leaders of the industry are, and similarly with a list of Top Crypto and Blockchain Exchanges in the World. CCU is a one-stop research platform for all blockchain and crypto investors, that draws on a truly global view of cryptocurrencies — Live prices stem from CoinMarketCap. CCU’s API also pulls live news update, as a news aggregator, from the top blockchain and crypto news websites — CoinDesk, CoinTelegraph, Bitcoin News. If you look closely, the futuristic computer screens features the logo of Crypto Chain University on them. This site has become entrenched as another essential tool for crypto traders. CoinGecko is another of the special tools diligent investors habitually employ to optimize their holdings. The top digital currencies are ranked according to five key criteria. These are; developer activity, liquidity, community, market cap and overall public interest. Public source-code repositories allow the team to gauge developer activities, providing investors a snippet about whether the team is dedicated or appear less than resolute in their offering. Knowing whether there is any long-term merit in investing in any given crypto project is essential for avoiding lost time and disappointing returns. The site also looks at community engagements as a reliable metric of a virtual coin’s ranking. Coins that are well received by users typically show good initial earnings, and also good longer-term appreciation. Public interest is the ultimate determinant for any currency, and cryptos are no exception. Gauging public interest while marrying that metric into the others assembled, is the reason why CoinGecko has become such an indispensable tool in decision-making for so many traders. A cryptocurrency traders platform that offers diverse value to traders and investors, TradingView is another crypto staple with a great marriage of needed tools. Trading charts abound and the site forum has become a valuable source of successful strategies. Users are able to share comments and strategies, something many newcomers find priceless when first entering the cryptosphere. The site focuses on technical analysis depicted in charts and is a becoming known for some persistently valuable commentary. 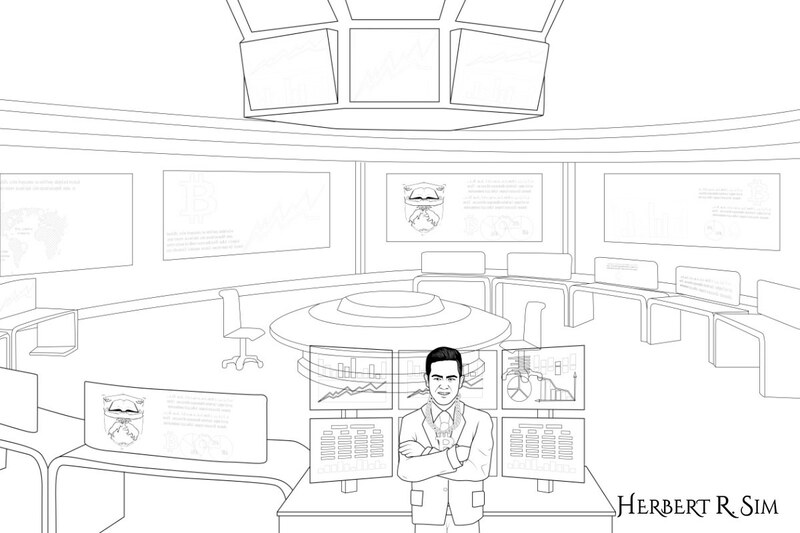 Traders value the diverse tools of charting, strategy discourse and historical comparisons. Community members on TradingView often give rise to different cryptocurrencies’ price predictions, as well as valuable overall market analysis. 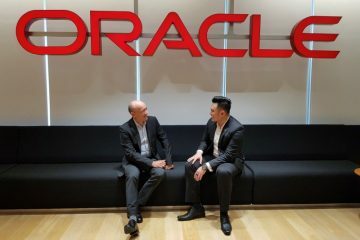 Users also debate other fintech arena staples like legacy stocks and forex trading, but the focus is decidedly cryptocentric. The site is seen by many as one of the best and most essential ports of call for any enthusiast, as the forum chats enable the development of a solid, comprehensive view of the cryptocurrency world. Any new trader who first needs to glean an understanding of how technical analysis is compiled, would do well to become a regular visitor. Another very useful aspect to the site is that, since the level of discussion is serious and investment-oriented, the users almost form an authoritative quorum, signaling the possible rise of various coins. Both new and seasoned traders value and patronize the site, and the project manifests as an intuitive and simple build, easily dispensing highly relevant information. The Blockfolio app is a mobile, digital coin, value monitor. Billed as a crypto “management” app, it allows users to maintain real-time pricing on ethereum, bitcoin, litecoin, ripple and many others. The price lists display over 3000 pairs worth monitoring, and users can also set up price signals with the app. Blockfolio gives a genuinely global snapshot of the cryptosphere, and new users quickly come to peg prices leaning on the project as the last word. To date, it have been, and the available streaming intel emulates legacy fintech companies’ offerings. The app draws on over 100 exchanges to sketch its global view, showing candlestick charts and a current order book for all listed cryptocurrencies. Many investors and traders track their strategies with the app, as it enables a total value on digital holdings, as well as the details of individual coins held. Many active traders use the signal service to glean entry points (when a coin reaches a certain price) and take-profit (when a coin reaches a certain price). Having this aspect of investing automated eases the process of decision-making and also lends a professional air to crypto transacting. 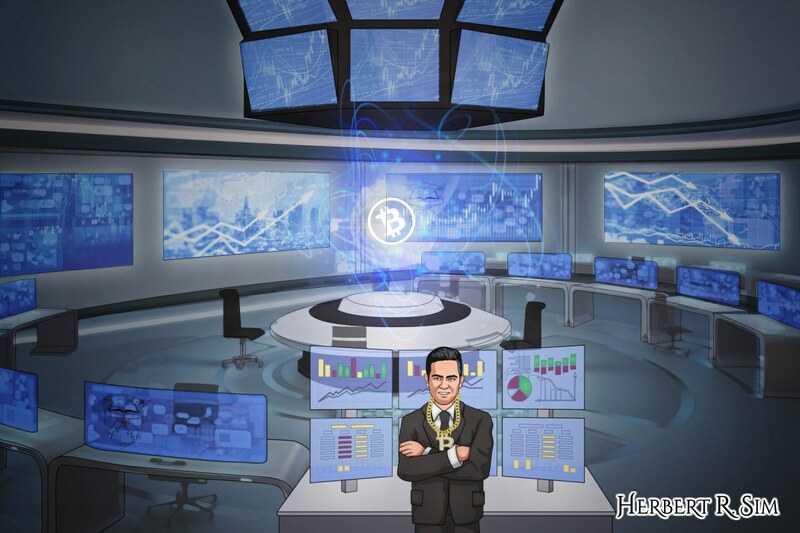 In the final illustration with full color, it showcases a hologram projection of BITCOIN in the center of the room. These five tools above are not exclusive but, in an arena where standards are rising rapidly, aided by regulatory oversight, they stand out as sterling aids for newcomer and experienced traders and investors alike. Decision-making is a critical component of any investment, and none are better than well-informed decisions. Employing the five tools above, investors and regular traders cut through persistent hype and noise and are able to trade confidently. Gleaning current and correct market information affords any investor an edge. While knowledge might be key in business development, is is also the key component in an investor’s ability to gain confidence and establish a profitable portfolio. Most initial users of these sites remain loyal, as all of these tools capably retain value as a user transitions from newcomer to seasoned trader or investor.